Simply put, home automation puts you in control of basic home systems and appliances from a single access remote point – like a smartphone app, or at a centralised unit inside your home. Just like some of the futuristic technology seen in television shows, it’s now possible to control things like your home temperature, lighting, and even security systems with the touch of a screen, the swipe of a finger and the sound of your voice. Worried that the kids didn’t lock the doors before they ran off to play? Or that someone will discover your not-so-secret hiding place for the extra key? Take control of your home safety from a simple app. With some products, you can even get an alert every time someone enters your home. Home automation literally pays off. When you are able to use home systems and appliances only when needed, the savings will be apparent in the first utility bill. No more wasting money on lights left on when you aren’t home, or spending money on fuel to drive home because you forgot to lock the door. Monetary savings are apparent, but you’ll also be saving time. No wasted trips home, no running through the house turning everything off, no time spent worrying about what was or wasn’t turned off. Ever leave for work in the morning when it was a comfortable 68° outside only to come home to a sweltering house because the temperature shot up to 90°? 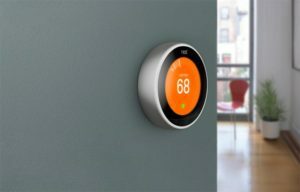 Connected home products to a Wi-Fi Thermostats let you conveniently adjust your home temperature from the mobile app so your family is always comfortable. One of the biggest hidden benefits that comes with home automation is peace of mind. No more worrying if you turned of the lights, locked the door or turned off the television. For people who have a lot on their plates, being able to easily check these items off the to-do list and stop the obsessive worrying, home automation is reassuring and definitely worth the investment. As the world becomes increasingly wireless, smart home technology becomes more integrated into in our everyday lives. But as security concerns linger, hiring an expert to install home automation is important to avoid any possible hacking or security breaches in the system. We believe home automation should be simple and affordable. That’s why we offer a complete smart home solution for lighting, heating, security, audio, blinds and more. Smart Home is one complete ecosystem with one central brain and just one app.